North Korean leader Kim Jong Il and Russian President Dmitry Medvedev meet in Buryatia on Wednesday. NEW: Russia's leader says he has a "positive feeling about the meeting"
(CNN) -- North Korea is ready to return to nuclear talks without preconditions after a two-hour meeting Wednesday between Russian President Dmitry Medvedev and North Korean leader Kim Jong Il, a Russian official said. "Kim Jong Il has expressed his readiness to resume the six-party (nuclear) talks without preconditions, and then during those talks (the North Koreans) will be ready to impose a ban on the production of nuclear materials and their testing," Medvedev's spokeswoman Natalia Timakova told Russia's Interfax news agency. The last round of six-party talks took place in 2008. In addition to Russia and North Korea, the talks also include South Korea, Japan, the United States and China. "I have quite a positive feeling about the meeting, which was sincere, rich in content and multi-faceted," Medvedev said on Russian TV. While North Korea has called for the resumption of six-party talks without preconditions before, the United States and South Korea have insisted on a tangible demonstration from North Korea that it is serious about denuclearization. Washington and Seoul did not immediately respond to Wednesday's developments. Medvedev also said the two leaders agreed to build a pipeline that would annually transport 10 billion cubic meters from Russia to South Korea via North Korea, Russian state TV reported. A trilateral commission will be set up to oversee the project. Kim arrived to the meeting in an armored 1995 Mercedes S-class limousine, sporting his trademark khaki jumpsuit, Russia's Interfax news agency reported. "I am very happy to see you," Kim said. "We are meeting 10 years after we first met," Interfax reported. "Yes, that was in Pyongyang," Medvedev replied. "I have warm memories of that visit,"
The session took place at a Russian army base outside of Ulan-Ude, the capital of Buryatia in eastern Siberia, some 5,600 kilometers (3,500 miles) east of Moscow. 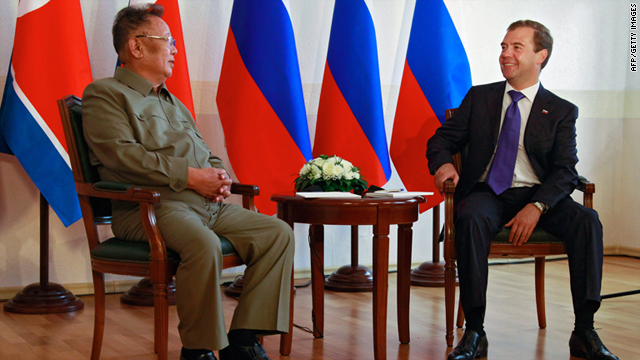 This is Kim Jong-il's third visit to Russia. He came to Russia in 2001 and 2002, and like the previous two trips, travelled all the way from North Korea in his own armored train. RIA-Novosti said Kim's train consists of 17 rail cars, plus four Russian cars that were added in Russia's Far East to transport local Russian officials and extra security guards and service personnel.